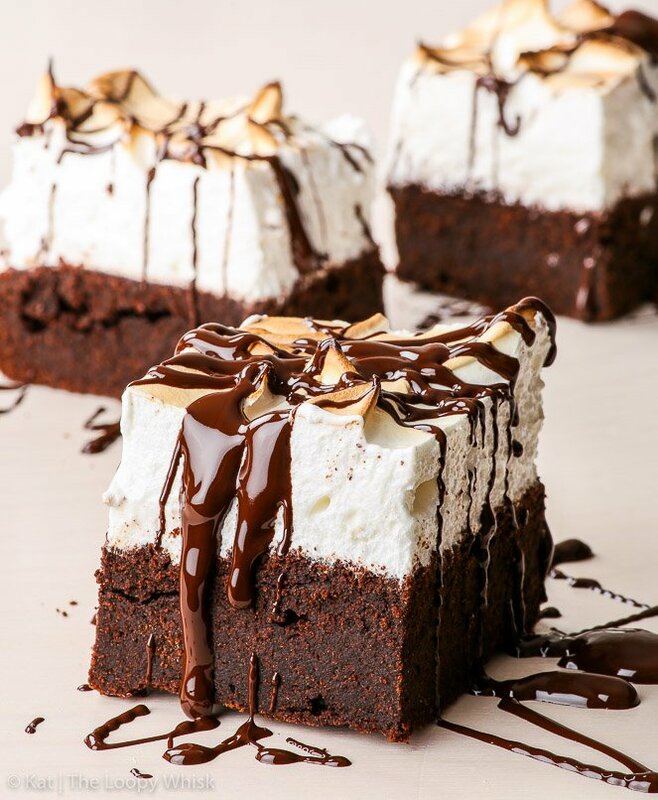 You will love these marshmallow brownies. There’s no question about it. 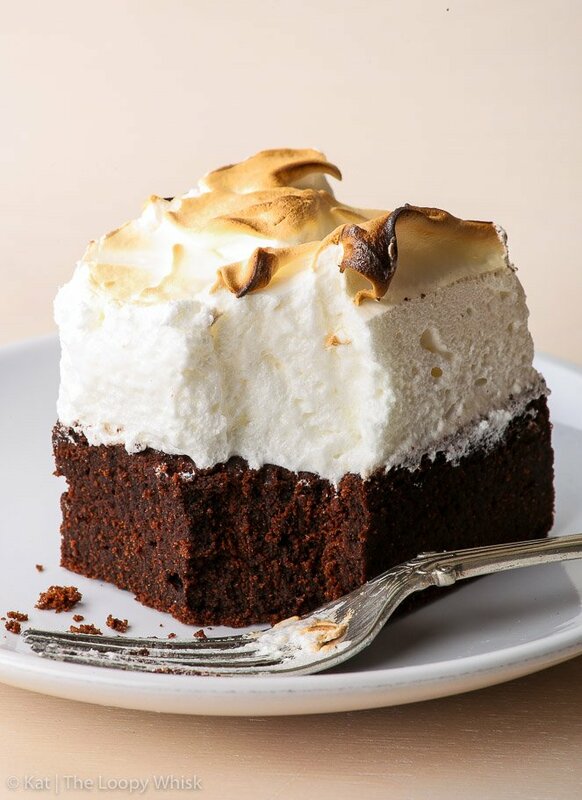 How could you not love a gluten free dessert that combines two of the best things ever – a fudgy, dense, chocolatey brownie and the fluffiest marshmallow meringue frosting you could possibly imagine. And there’s also a video; so you can feast your eyes on pure melted chocolate sinfulness. That’s a very strange opening line, but bear with me. I don’t trust marshmallows because they are too squidgy, sweet and spongy to do anything good for me. I know they are an occasional treat, but I always feel their white fluffiness hides an ingredients list I really don’t want to know about. I was 22 when I first tasted a marshmallow. (Yes, I did have to think a minute or two about that… Is it embarrassing that I don’t know my own age off the top of my head?) At least I think I was – there may have been an earlier time, but if there was, I’ve erased it from my brain. No, they weren’t any better than I expected them to be. I haven’t gotten around making my own marshmallows yet, but this wonderful marshmallow meringue frosting is definitely the next best thing. It might even be a tiny bit better (I’ll have to get back to you on that). You know what makes this frosting SPECTACULAR? Piling it on top of fudgy brownies. Yep, I went there. These sky high marshmallow brownies are probably one of the best things my sugar-loving brain has come up with. There’s nothing complicated about these marshmallow brownies. Fudgy, decadent, intensely chocolatey brownie. A thick layer of sweet, pillowy marshmallow meringue frosting, toasted under the grill for a few seconds. See, nothing scary or impossible there. But for all their unpretentious simplicity, these heaps of goodness will take your breath away. (Wait, was that to cheesy? Meh, just roll with it.) I mean it. Oh, you think one piece will be enough? Think again. Here’s what is absolutely brilliant about these marshmallow brownies: you can cut them into clean, minimalistic squares and leave them looking all sophisticated, like they wouldn’t look out of place at an afternoon tea in a posh hotel. 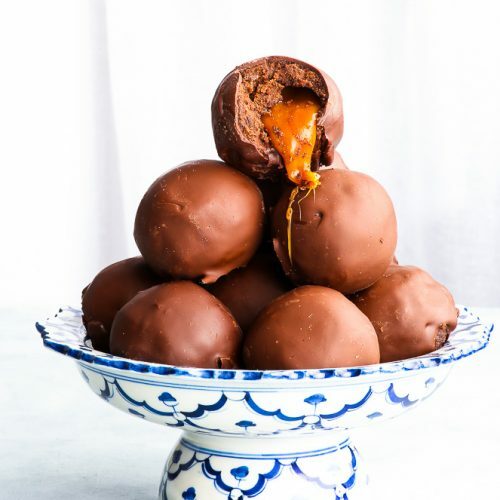 But you can also drizzle them with almost-too-much melted chocolate (“almost” because there is no such thing as too much chocolate), transforming them into a beautiful beautiful mess that will leave you drooling. Perhaps not quite posh hotel worthy… but that’s their loss. And why “sky high”? 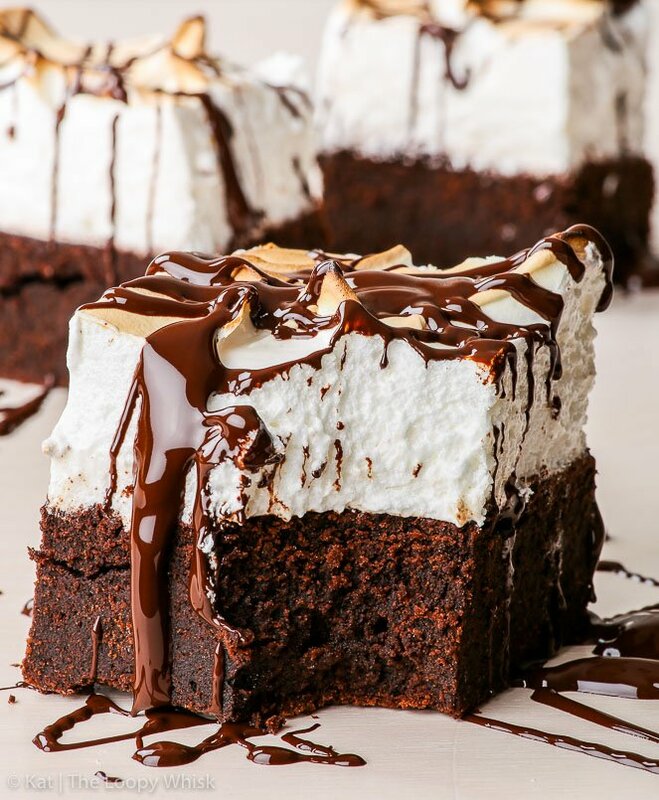 I’m sorry, have you seen these marshmallow brownies? Scroll up again and look at that tower of deliciousness. 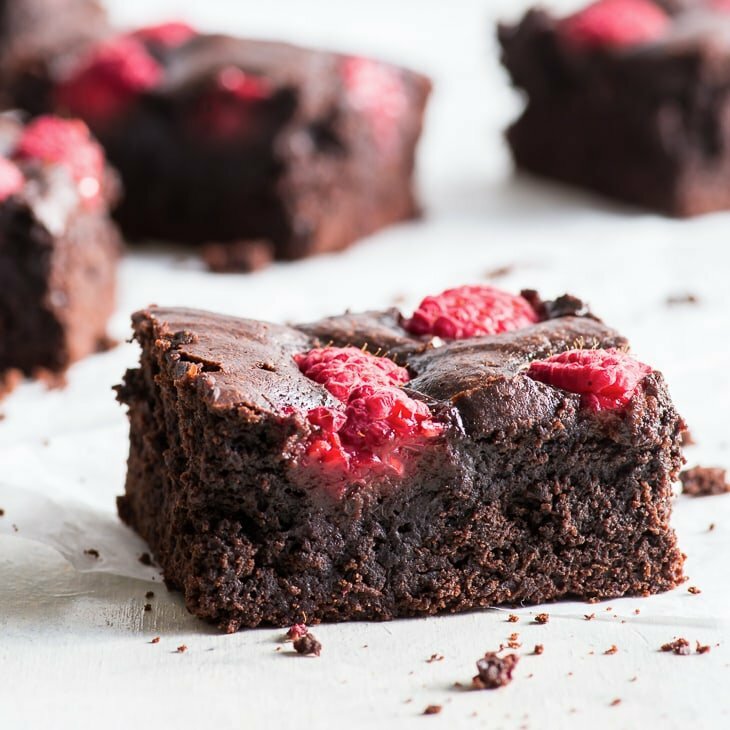 Oh, and as an added bonus, these brownies are also gluten free – with a dairy free option, if you sub in coconut oil instead of butter and use dairy free dark chocolate. Yumminess is guaranteed either way. These brownies are the dessert you make when you desperately want to impress someone, but are lacking the time, energy or the enthusiasm (hey, it happens!) for a complicated bazillon-step baking procedure. Of course, they are also the perfect dessert to make just for yourself… and a friend, perhaps, if you’re feeling generous. Now, I still don’t trust marshmallows, at least not the store-bought ones. But I definitely trust these marshmallow brownies… to keep me happy, floating on a fluffy, sugary cloud. Coated in chocolate. I absolutely swear by these heat-proof Pyrex mixing bowls whenever I have to melt chocolate over simmering water. When measuring your ingredients, I am a firm believer that grams and a kitchen scale is the way to go… but brownies are forgiving, so measuring cups and spoons are just fine in this case! To make sure you don’t lose any of the delicious brownie batter, always use a rubber spatula – they’re a must have in any kitchen! 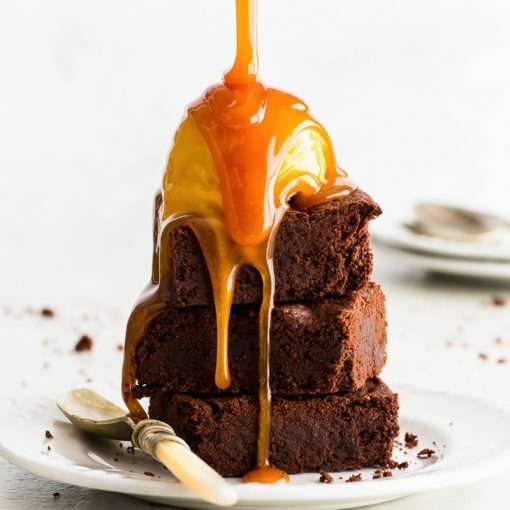 And if your brownies come out of the oven under- or over-baked, it could be that your oven isn’t correctly calibrated: check it with an oven thermometer! 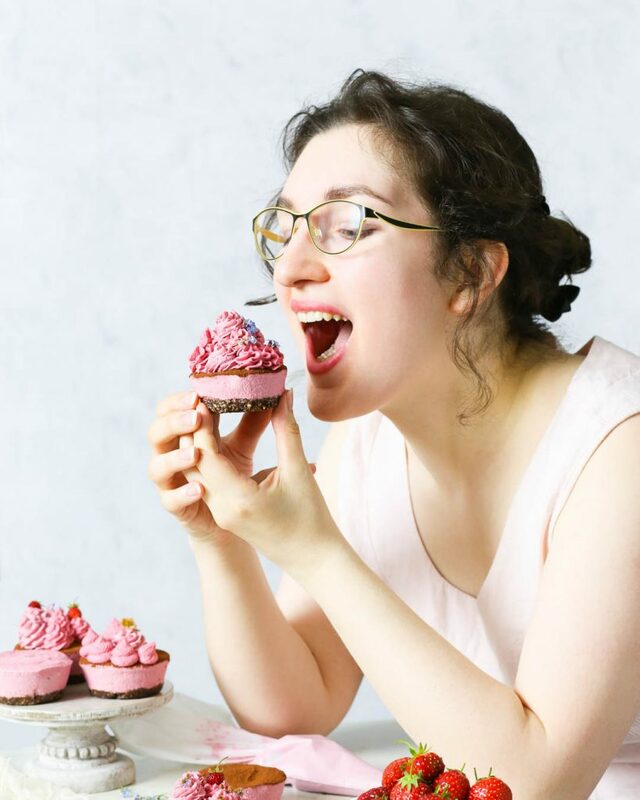 You want your marshmallow frosting to be as fluffy as possible – I like to make it in my KitchenAid stand mixer, but a quality hand mixer will work just as well. I recommend the VonShef hand mixer, it works like a dream. And to make sure you don’t overcook your egg whites, use a kitchen thermometer! Pre-heat the oven to 350 ºF (175 ºC) and line an 8 x 8 inch baking pan with greaseproof/baking paper. In a bowl above simmering water, melt together the dark chocolate and butter. Once melted, allow to cool until warm. Add caster sugar, cocoa powder, eggs, vanilla extract and salt to the melted chocolate-butter mixture and mix until everything is evenly incorporated. Add the hot coffee and mix well. Sift together the gluten free flour and xanthan gum, and add them to the brownie batter. Mix until everything is evenly incorporated and no flour clumps remain. Transfer to the line baking tray and smooth out the top. Bake in the pre-heated oven at 350 ºF (175 ºC) for about 20 minutes or until an inserted toothpick still comes out slightly dirty. Mix all the marshmallow meringue ingredients in a heat-proof bowl, and set the bowl above a pot of simmering water. Heat the meringue mixture with constant stirring until it reaches 140 ºF (60 ºC) and the sugar has melted. Transfer the heated meringue mixture into a stand mixer (or use a hand mixer) and whisk the mixture for 5 - 7 minutes, until it reaches room temperature and forms glossy peaks. Do not over-whisk as you can lose some of the fluffiness. 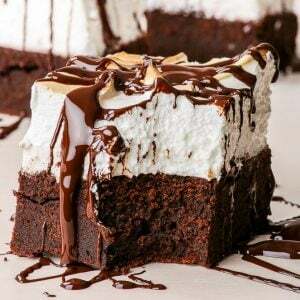 Pile the marshmallow meringue on top of the brownies (still in the baking pan) and using a spoon or spatula, create peaks on top. Place the marshmallow-covered brownies under the grill for no more than 5 - 10 seconds until they are nicely toasted. Really keep an eye on them, as they catch quickly! (You can also use a kitchen blowtorch). Allow the marshmallow brownies to cool slightly, cut into pieces, drizzle with melted chocolate (optional), and enjoy! The marshmallow brownies keep well in a closed container in a cool dry space for 3 -4 days (hah, good luck with that). 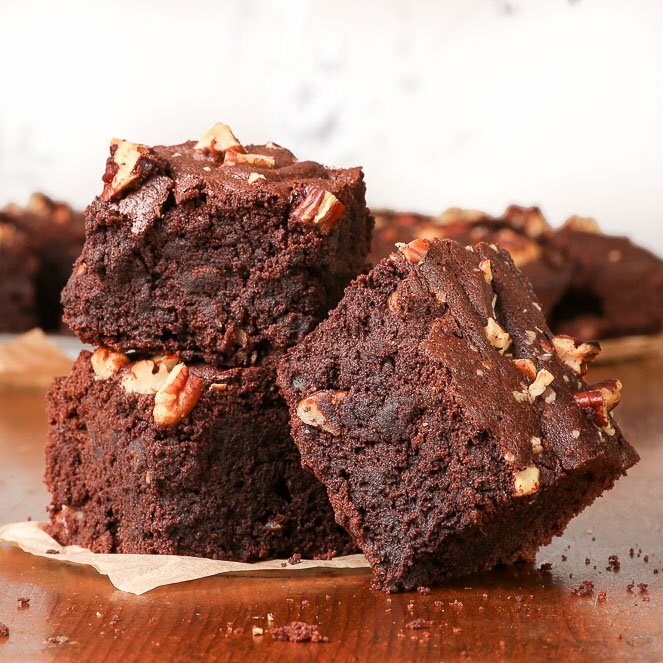 Looking for more delicious brownie recipes? 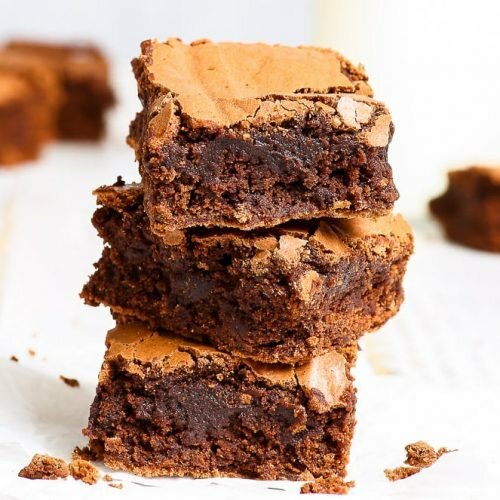 The Best Vegan Chocolate Brownies. Ever. 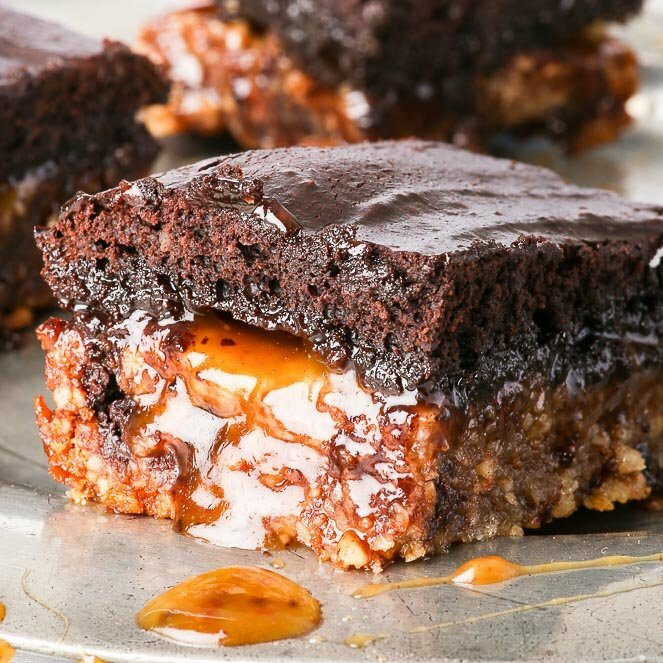 These brownies look ridiculous… in the best way possible. JEEBUS these look incredible. What Ben Myhre said above, basically. Wow! These brownies look so delicious! I will be baking this weekend. They look so Yummy. Do the brownies need to be cool before putting on the meringue? 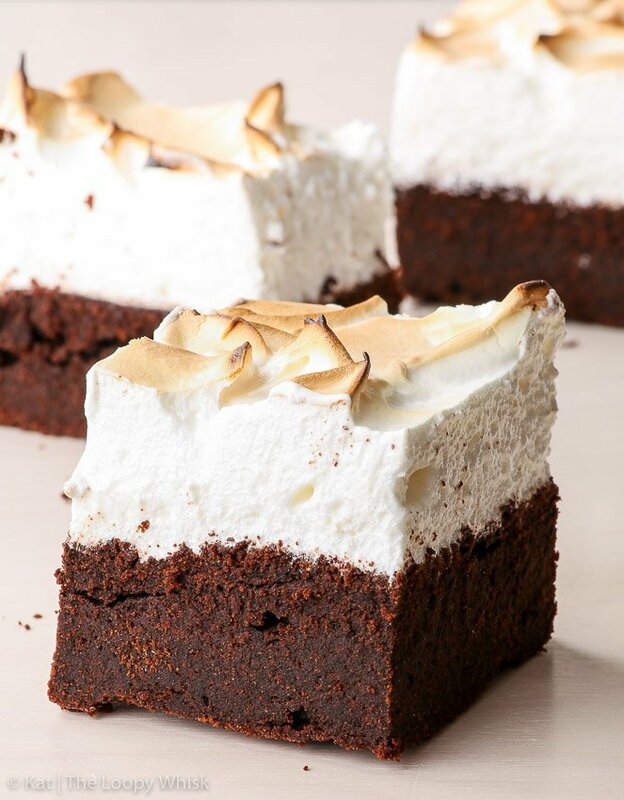 Do the brownies need to be cool before adding the meringue? delish! I made these and only realized that my eggs were “large” and the recipe called for “medium”when I was making the meringue. They were delicious anyway (and very impressive) but I will use “medium” eggs next time. Do you think the recipe would work with coconut sugar in place of the caster sugar? Is the flour used self raising or plain? Hi Jackie, I’ve used plain (gluten free) flour. Is there a substitute for the coffee? My friend is always looking for great gluten free brownie recipes, but coffe makes him sick. Has anyone tried this with regular flour? If so how did it turn out? Would you mind sharing the name &/or link of your gluten-free flour? I need one With those ingredients – no sorghum. Thanks for the great recipes! Hi! I’m looking for a dairy free icing. Would this icing be ok without the toasting? I’m looking to frost a carrot cake to decorate for Easter.